Jay Pandya, 32, is salaried and lives in Navi Mumbai with his homemaker wife, five-year-old child and mother. He brings in a monthly salary of Rs 1.21 lakh, and after including a rent of Rs 15,000, the total comes to Rs 1.36 lakh. 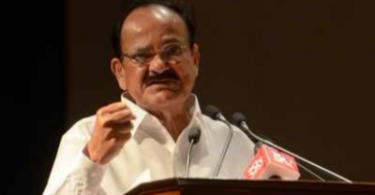 He stays in a rented accommodation, though he has his own house bought with a loan of Rs 55 lakh, and for which he is paying an EMI of Rs 32,000. His goals include building an emergency fund, saving for his child’s education and wedding, and his own retirement. His portfolio comprises Rs 90 lakh of real estate; equity worth Rs 15.08 lakh in mutual funds; debt in the form of EPF (Rs 17.12 lakh), PPF (Rs 40,000), NPS (Rs 83,000) and debt funds (Rs 1 lakh); and cash of Rs 75,000. After household expenses, insurancepremium and investments, he is left with a surplus of Rs 16,155, which should not be left idling. 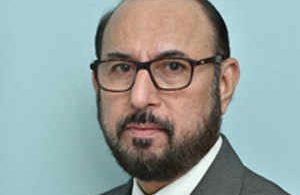 According to Financial Planner Pankaaj Maalde, Pandya can build an emergency fund of Rs 2.9 lakh, which is equal to three months’ expenses, by allocating his cash and debt fund. This should be invested in a liquid or short-duration debt fund. For the balance, he should put in the current surplus in the same fund for seven months. 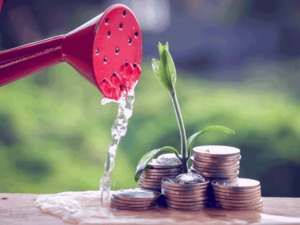 Annual return assumed to be 12% for equity and 7% for debt funds. Inflation assumed to be 7%. 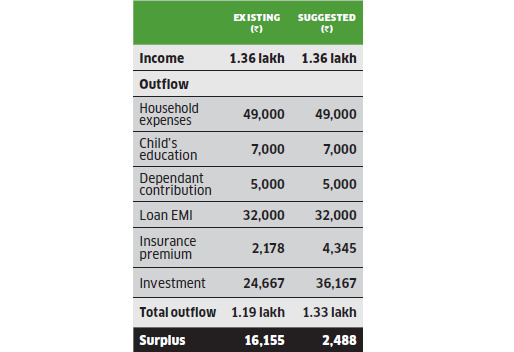 To build a corpus of Rs 1 crore for his child’s higher education in 13 years, he will need to start an SIP of Rs 17,000 in a diversified equity fund. As for the Rs 58 lakh he needs for the kid’s wedding in 20 years, he will have to start an SIP of Rs 6,000 in a diversified fund and Rs 1,000 in the gold bond scheme. He can then focus on his retirement goal, for which he needs Rs 9 crore in 28 years. 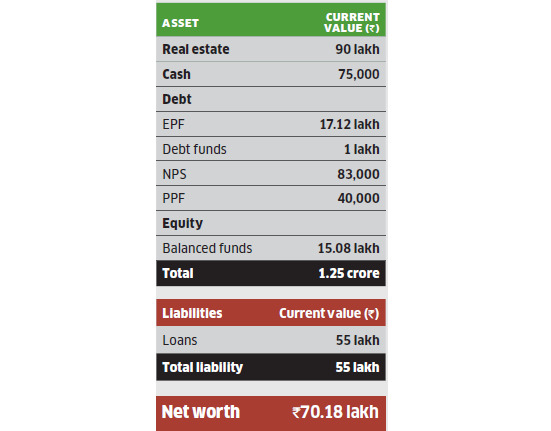 He can allocate his EPF, PPF, NPS and equity fund corpus to this goal, which is likely to yield Rs 6.9 crore in the specified period. He will also have to start an SIP of Rs 12,167 in a diversified equity fund and can do so after building the emergency corpus. He should also continue putting in Rs 500 a year in the PPF. As for life insurance, Pandya has two term plans of Rs 1.5 crore and doesn’t need any more cover. 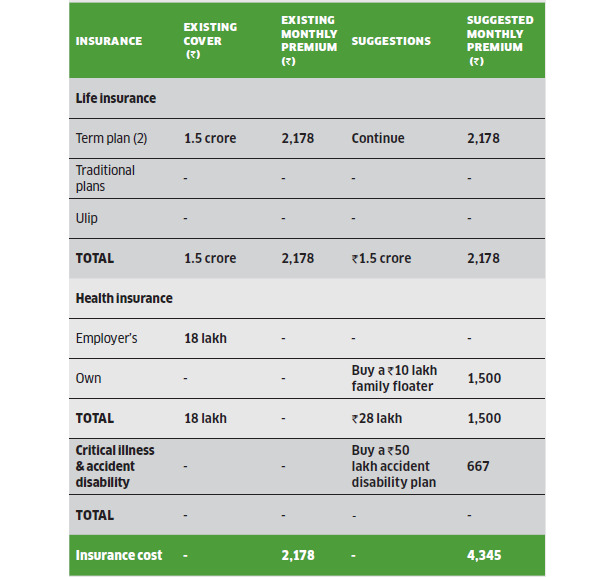 For health insurance, Pandya has an Rs 18 lakh cover provided by his employer. However, Maalde suggests he should not depend on his employer’s medical plan alone and should consider buying an independent family floater plan of Rs 10 lakh, which will cost him Rs 1,500 a month in premium. He should also consider buying a Rs 50 lakh accident disability plan for himself, which will cost him Rs 667 in monthly premium.